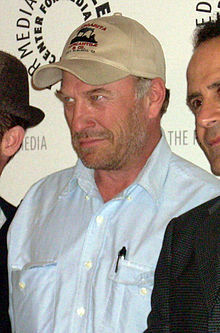 تد لواین (اینگیلیسجه: Ted Levine) آمریکالی اوْیونچو. ۲۹ مئی ۱۹۵۷ ‏ ایلینده آمریکادا دۆنیایا گؤز آچیب. 1983–گۆنوموز ایللر آراسیندا سینما ساحه‌سینده چالیشیب. 1992 The Paint Job Kenny the D.J. 1984 American Playhouse Commander Episode: "The Killing Floor"
1990 Midnight Caller Frank Brewer Episode: "With Malice Towards One"
1995 Nowhere Man Dave 'Eddie' Powers Episode: "Absolute Zero"
Sinestro (voice) Episodes: "Absolute Zero"
1998 From the Earth to the Moon Alan Shepard Episodes: "Can We Do This?" 2002 Third Watch Brian O’Malley Episode: "Falling"
2004 Static Shock Sinestro Episode: "Fallen Hero"
2012 Luck Isadore Cohen Episodes: "Ace Meets with a Potential Investor"
"Ace and Claire Tour a Horse Farm"
"Ace Counters Smythe's Move with His Own"
"Two Prized Colts Go Head-to-Head"
2015 The Spoils Before Dying Gerhart Moll Episode: "The Trip Trap"
2016 Mad Dogs Conrad Tull Episodes: "Seahorse"
2016 Ray Donovan Bill Primm Episodes: "Girl with Guitar"
"Little Bill Primm's Big Green Horseshoe"
2016 Lethal Weapon Ned Brower Episode: "Best Buds"
2018 Here and Now Ike Bayer Episodes: "Wake"
↑ ACCA 1991 - AwardsCircuit - By Clayton Davis - Celebrating 10 Years. یوْخلانیلیبOctober 28, 2018. ↑ Into the Wild Leads S.A.G. Awards - Observer. یوْخلانیلیبJune 9, 2018. ↑ 2012 Nominees – 3rd Annual 20/20 Awards - 20/20 Awards - Films that have stood the test of time. یوْخلانیلیبJune 9, 2018. ↑ Beaufort International Film Festival takes place in Beaufort, SC. - 2015. یوْخلانیلیبJune 9, 2018. اینگیلیسجه ویکی‌پدیاسی‌نین ایشلدنلری طرفیندن یارانمیش«Ted Levine»، مقاله‌سیندن گؤتورولوبدور. ( ۲۲ ژانویه ۲۰۱۸ تاریخینده یوْخلانیلیبدیر). قارداش پروژه‌لرده تد لواین گؤره داها آرتیق بیلگی‌لر تاپابیلرسینیز.